My family and I rented a lovely beach house in Outer Banks, North Carolina the first week of June. It was a wonderfully relaxing vacation. Early morning and late evening walks on the beach, days playing in the sand and surf, afternoon naps, and evening family time made up most of our time. It was perfect! 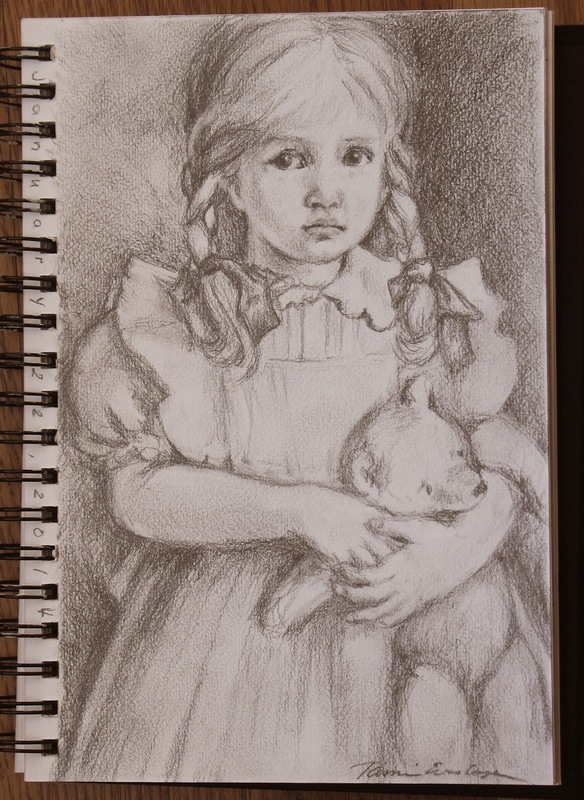 I also spent a couple of afternoons playing in my sketchbook on the house's screened porch in the delightful company of my young nieces and nephew who worked along side of me in their own artistic persuits! Here is what I worked on. This is a collage page I made with found images that represent a few of my favorite things. My childhood passions are always a part of me! I still need to decide how to finish it. I also finished this drawing which I had started earlier. I was drawing from an image like I usually do when drawing a face, but I was becoming frustrated at trying to copy it. When I put the image aside and finished the face on my own, I was much happier with it. Sean said, "She looks like your face! I don't mean like she looks like you, but like your style of face, the face you like to draw and sculpt." Maybe this should not please me, but it did. Perhaps I should be dismayed that my drawings and sculpts all look the same, but I don't think they do. However, I do think that most professional doll makers have a recognizable style, a quality in the faces that makes their dolls appear related to one another. Looking at some things I have been working on recently I can see it a bit too. They are not the same, but They do look to be created by the same person. I think I have a recognizable style with my bears and I am pleased that I am beginning to develop that with my dolls. Now I just need to actually finish some dolls! Oh my goodness--I love your beautiful drawings! Both are exquisite. They do look like they are drawn by the same artist, as do your beautiful doll sculpts. Wow! You are really very talented, Tami. Thank you for sharing with us! Thank you Debora! You are so kind!